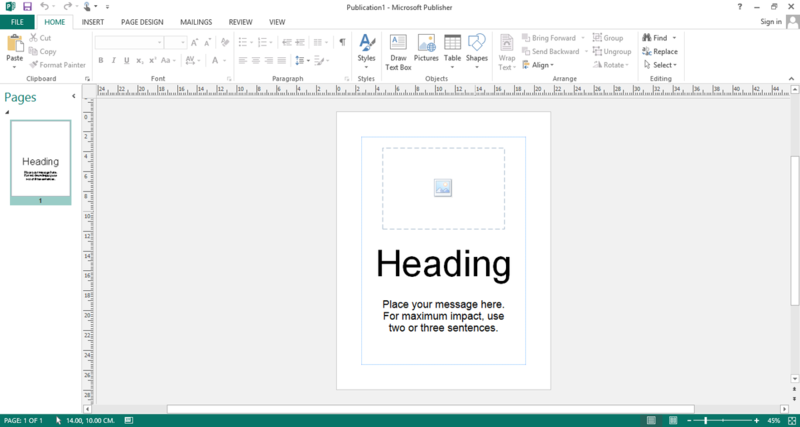 The Microsoft Publisher app is creatively designed to create publications that are commonly business oriented in nature. It allows you to create and publish business and communication materials in the most unique ways for websites, e-mail correspondences and so much more. The interactive versatility of this virtual handyman in the challenging world of online publications is known. However, if you would try to create a publication by using its 2007 edition, you will not be able to utilise its prominent highlights. You are better off with newer versions like 2010 or 2013. Read on to learn how the creation of the freshest publications is done to help your website or business generate more traffics and leads. Regardless of its version (2010 or 2013), here are the easiest ways on how to go about your own masterpiece. Learn these steps by heart and you will surely find your special place in cyberspace publications. 1. Start a Publisher. Click one of the many kinds of publications in the Publication Types. For instance, you want to make your enthralling versions of Newsletters. 2. Find the Newsletters catalogue. Here, you only have to click a particular design that is closest to your heart. 3. Choose other options such as schemes of colours, a given set of business information and then you have to click the word create. 4. If you desire know more about other areas of creating publications that involve different font schemes, all you have to do is click create followed by font schemes. After a few minutes, artistically crafted designs for professional use are exclusively yours. Given this powerful Microsoft Publisher app, you need not to worry about anything when you want to strongly establish a remarkable business legacy that will leave an indelible mark in a competitive industry like computers. Image: By Shot by Codename Lisa (talk · contribs), "Used with permission from Microsoft."